COLUMBIA, SC (WIS) - Bates Middle School has gone to the dogs. A 14-week-old therapy dog named Bantam has stolen the hearts and minds of the entire school community at Bates Middle School in Sumter. Bantam, a miniature schnauzer, has joined the school as a therapy dog in training specifically for many of the special education students the school teaches. Kelly Snell, a first year teacher at Bates, is in charge of training Bantam and said this program has made such a difference. “We were just amazed at the difference in the children. 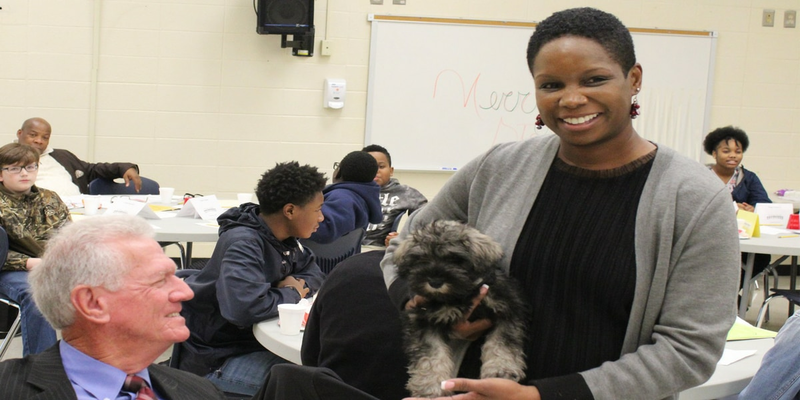 The children would tell us they couldn’t read and they wouldn’t read to us - but then when the schnauzer came, they sat and read to the dog.” Snell also says Bantam, named for their school mascot, provides a lot more than just an educational outlet. "Middle school can be a difficult age emotionally, and so many children are benefiting from Bantam - not just in my class.” Snell also noted that though Bantam is not a full fledged therapy dog yet, the students are in charge of his training, from walking to potty training, and at his 1st birthday he will be given the full therapy dog test for certification.